As a theatre lover I recognise that Broadway musical plays of the 1940s and 1950s such as Oklahoma and Carousel are as important pieces in their own way as the work of Brecht and Beckett, but I’ve never really been a fan. Probably to do with the fact that the actors in screen musicals like Howard Keel and Gordon MacRae always seemed a lighter thinner breed in comparison to Spencer Tracy or Humphrey Bogart or Henry Fonda. Possibly also to do with the fact that my teenage pop listening days also included that bizarre later era of musicals when every established dramatic genre was twisted and turned into a musical like Paint Your Wagon or Camelot or Scrooge or Man of La Mancha. However, despite not being a fan of most musicals, I am a fan of Guys and Dolls. This emerged from my great interest in the National Theatre in its early years at its home on London’s South Bank. That interest was spurred by their practice of touring productions to Glasgow plus the fact that one of their three auditoria, the Cottesloe, had a company for many years led by director Bill Bryden from my home town of Greenock. Guys and Dolls, by Jo Swerling, Abe Burrows and Frank Loesser, was staged at the NT in 1982, directed by Richard Eyre. He discussed it on Desert Island Discs in 1985 in an interview which is still available to hear on the BBC Radio 4 archive. One interesting snippet from the interview is that Laurence Olivier originally planned to produce Guys and Dolls during his own stint at the National Theatre. I love Eyre’s anecdote about Olivier’s criticism of his production’s New York accents being “a bit of a melange” and his view that Olivier’s vocal performance, in contrast, “would have been placed exactly to the right street corner”! 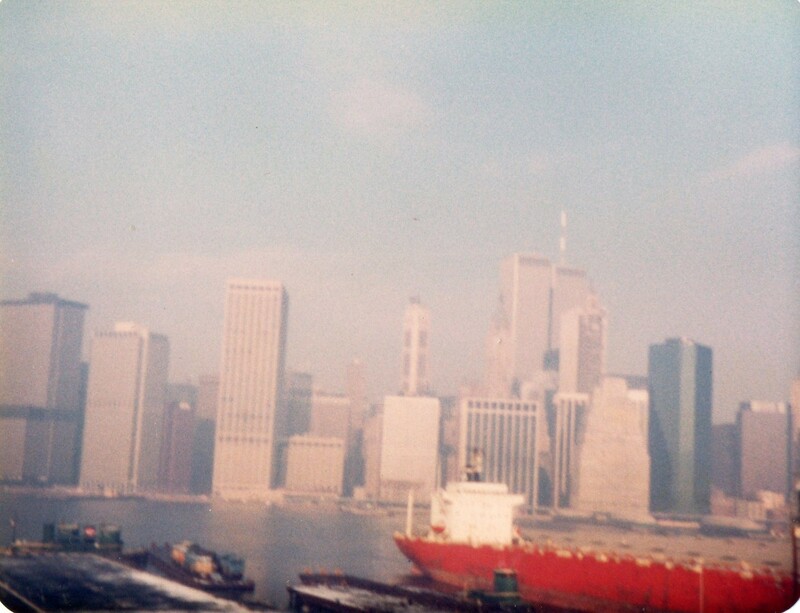 The southern half of Manhattan, as seen from the top of the Empire State Building in 2003. Near Times Square in New York – definitely “Guys and Dolls” territory. The NT was sometimes criticised in its early years for being too dependent on star actors and the cast of Guys and Dolls certainly had some of my own favourites of that time. Bob Hoskins of Pennies From Heaven and The Long Good Friday was Nathan Detroit (perhaps this led to his American characters in Who Framed Roger Rabbit and Mermaids), Ian Charleson of Chariots of Fire was Sky Masterson, Julie Covington of Rock Follies was Sister Sarah Brown. Among the supporting players was Bill Paterson as Harry the Horse. This cast did not come to Glasgow but I did see in Edinburgh a touring production in 1985, which Eyre refers to in the radio programme. I was always struck by that show’s slightly unbalanced casting. The main star billing went to Lulu, then finding her new route between two periods of pop music fame, who was Miss Adelaide. Nathan Detroit was played by long-established TV face Norman Rossington (similar to Bob Hoskins in his earthy persona I suppose, but perhaps then less fashionable). Sky Masterson was the black US actor, then unknown but later more familiar, Clarke Peters. I enjoyed the production although I felt it displayed more of the elements of an old traditional performance rather than a cooler new one. (I think this cast did, however, transfer to London for a time). “Sit Down, You’re Rocking the Boat” sung by Nicely-Nicely Johnston is traditionally regarded as the show-stopper song and David Healy had been retained from the original cast, but I definitely recall finding this section technically impressive (with its two encores which appeared to have become standard) rather more than emotionally or artistically. Soon after I enjoyed the film version, directed by Joseph L. Manciewicz, who was similar to Richard Eyre in being unused to directing musicals. Frank Sinatra and Marlon Brando were paired in the two leading male roles. Sinatra would possibly have been seen as a safe piece of casting as Nathan Detroit being an established performer in screen musicals alongside the fashionable but provocative young dramatic actor Brando, but it’s easy to forget that in 1955 he was still younger than 40 and only two years into the new career which had been launched by From Here to Eternity and its attendant Oscar. Some old American cars in Havana, Cuba, in 2014. Part of “Guys and Dolls” takes place in Havana, a glamorous spot for American gangsters in pre-Castro times. The Bacardi building in Havana, built in 1930. As with many folk of my age, my ideas and tastes in theatre were influenced by the writings of Kenneth Tynan, and Tynan’s review of the London premiere of Guys and Dolls still reads well: not just for his confident assessment of the show’s quality – “not only a young masterpiece, but the Beggars’ Opera of Broadway”, but his adoption of the language of its Damon Runyon characters: “Miss Adelaide, his ever-loving pretty who is sored up…”; “…being short of ready scratch, Nathan places a bet…”; “I will give you plenty of eleven to five that it is the first fugue that many patrons…ever hear”…; “I found myself laughing ha-ha… more than a guy in the critical dodge has any right to”. This is probably the most famous work of its songwriter Frank Loesser. Songs as strong as any by more famous musical craftsmen like Rodgers and Hammerstein, the fruity, quirky Damon Runyon dialogue and its exaggerated delivery by the flashily dressed small-time criminals; the New York setting – all combine to keep Guys and Dolls fresh in my affections. Until recently, I thought that, just as Frank Sinatra’s popular song “My Kind of Town (Chicago Is)” was first performed in the film Robin and the Seven Hoods, another ode to a US city, “New York, New York”, also originated in one of the singer’s later films. Until, that is, I saw Sinatra: All or Nothing at All, Alex Gibney’s excellent documentary,on BBC4, and realised that the song was only adopted by Sinatra a couple of years after it was premiered by Liza Minnelli in the Martin Scorsese film of the same name. The film centres around the relationship between a saxophonist, played by Robert De Niro, and a band singer, played by Minnelli, during the post-World War Two period when jazz music trends moved from big band swing to improvisational be-bop and when recording and films were becoming available to singers, like Sinatra, whose ambition and popularity were pulling them beyond their band origins. New York, New York reminds you that at one time Scorsese was a director whose films were not wholly concerned with the male crime world. However, it does have two scenes which prefigure two later films which are certainly on that theme, all of them involving Robert De Niro. One is the early shots of musician Jimmy Doyle characterised by his Hawaiian shirt with its slogans and bright colours which anticipate the early shot in Cape Fear of the tattooed back of the psychopathic Max Cady. Another is the scene of Doyle making a phone call which we can’t hear (partly because of the playing of the club band) but which we sense will have serious consequences due to Doyle’s changing facial expressions, similar to the shot in Goodfellas where Jimmy Conway watches the behaviour off-camera of a fellow gangster whom he is forming a plan to kill, his organised but violent thoughts evoked by the driving guitar rhythms of Cream’s “Sunshine of Your Love”. Of course, Scorsese’s contemporary Francis Ford Coppola is also most famous for films about criminals – The Godfather trilogy – and coincidentally he too essayed a film about a past era of musical performers. Where New York New York covered the period immediately after World War Two, The Cotton Club features a mix of real-life and fictional gangsters, musicians and dancers associated with the Harlem night-club in the Prohibition era of the 1920s and early 1930s. Like New York, New York, The Cotton Club was filmed on large studio sets rather than on locations such as the directors had previously preferred. Neither film was a success at the time, and both, in my opinion, suffer from having less attention being paid to narrative and characterisation than to design and music. The Cotton Club does have a notable scene towards the end where gangland violence is interspersed with a male dancer’s energetic rehearsal. It is a welcome memory of Coppola’s more successful films, where he depicts Mafia killings taking place at the same time as, and under the social and religious camouflage of, weddings or christenings. And returning to our first reference, Frank Sinatra, Alex Gibney’s documentary stated that, unlike the singer Johnny Fontane in The Godfather, Sinatra did not get his film role in From Here to Eternity through Mafia influence. Gibney’s explanation was that it had more to with rival actor Eli Wallach asking for too much money! 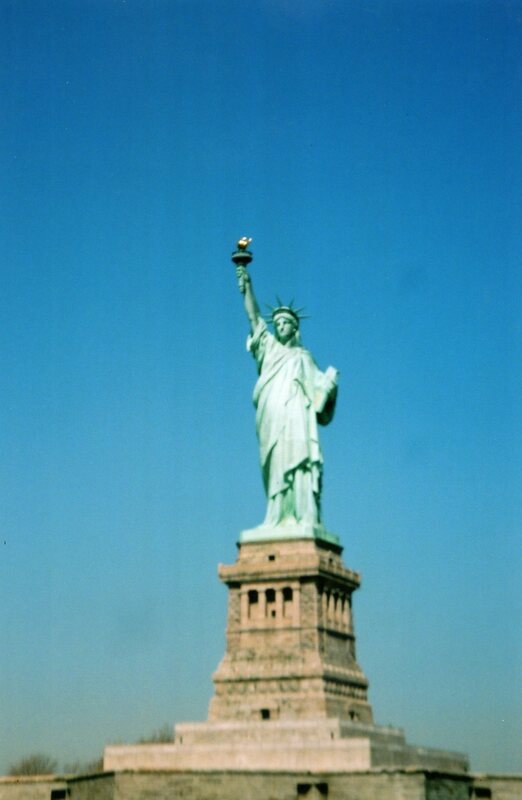 The Statue of Liberty – famous landmark for immigrants arriving in New York by ship since 1886. 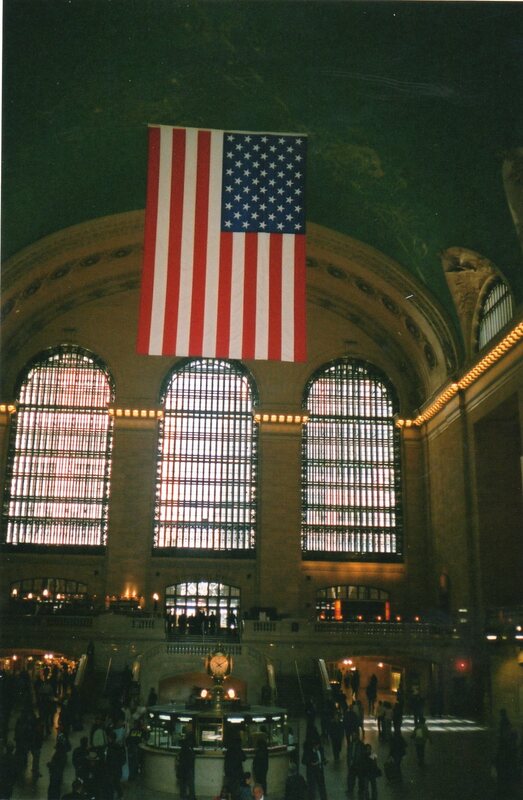 The concourse of Grand Central railway station, completed in 1913. 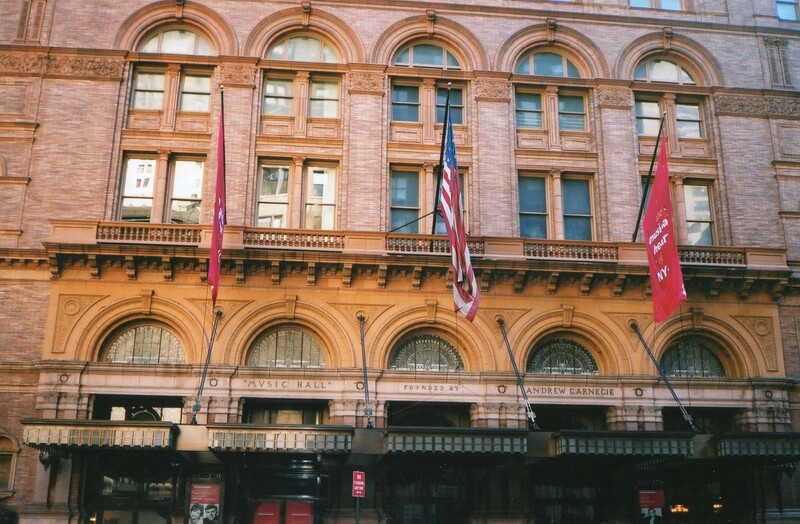 The Carnegie Hall music venue, built in 1891. 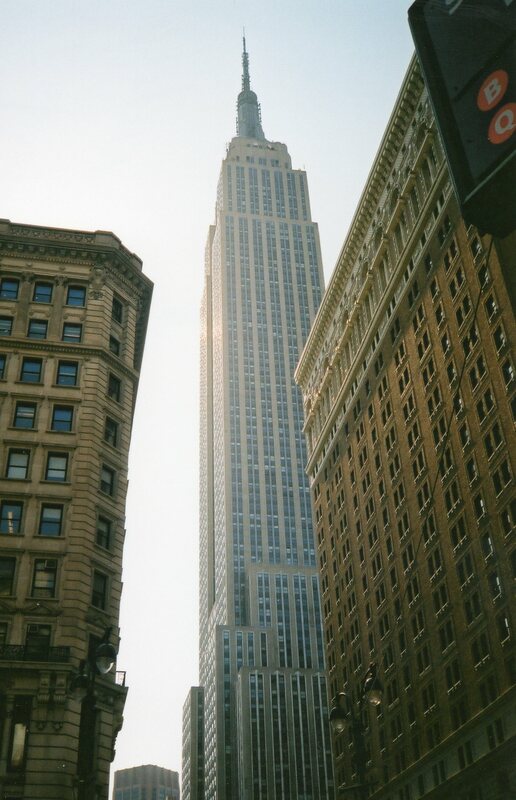 The Empire State Building, built in 1931, surrounded by earlier high-rise buildings. 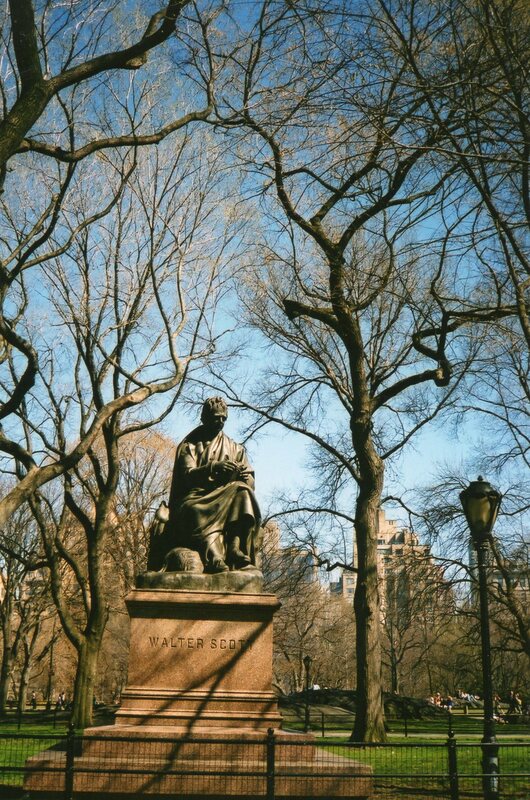 One of the many 19th century sculptures in Central Park, but perhaps a less likely one: of Sir Walter Scott. 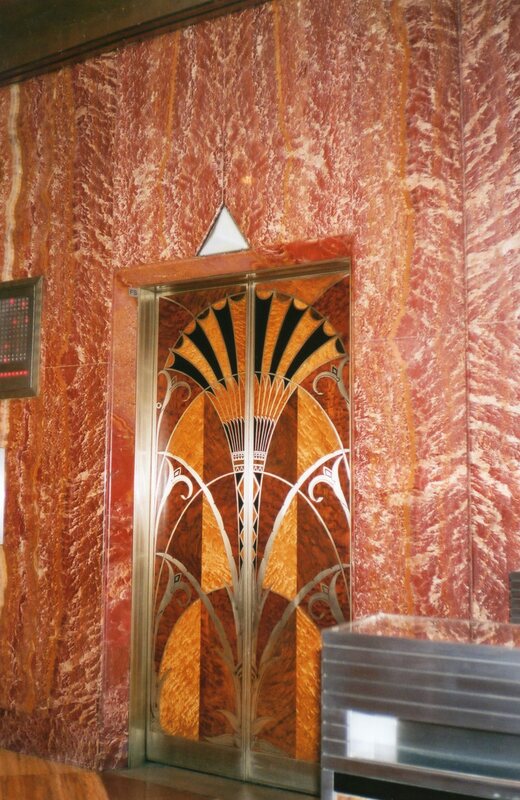 Part of the 1920s art deco foyer of the Chrysler Building. 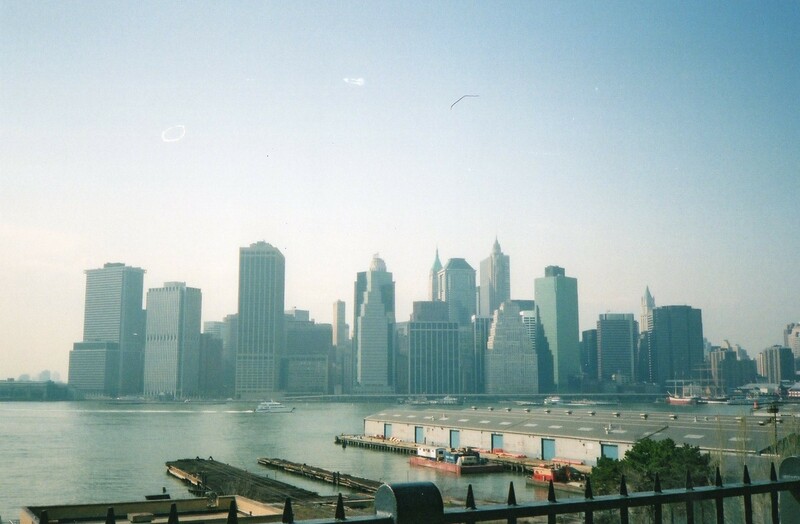 Most people would surely agree that New York is one of the most photogenic cities in the world. These photos were taken in the long ago pre-digital days, during one of my first visits in January 1984. I’m fond of the colour contrast of the photos, which was given free, without any planning by me, by the hazy winter sunlight. 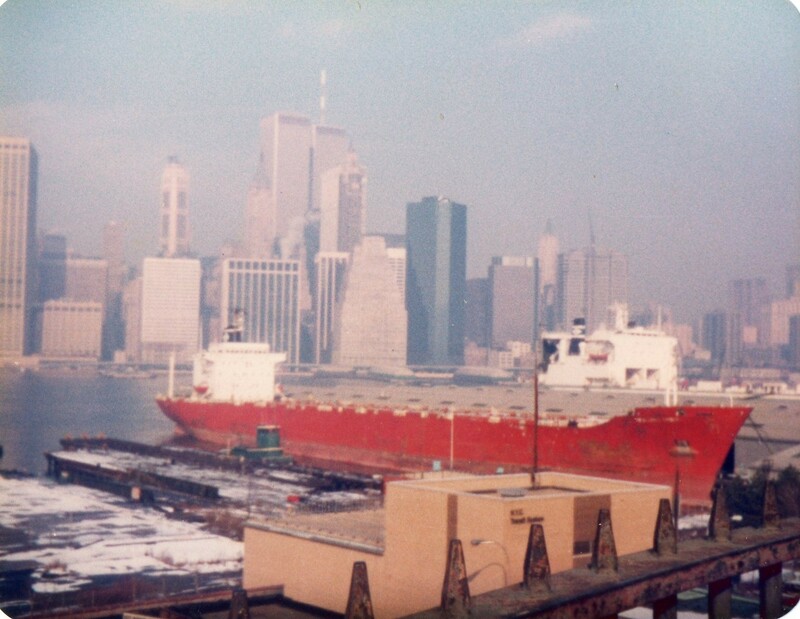 The pre-2001 presence of the World Trade Centre is telling, but, even more striking for me, are the foreground ships, suggesting a still busy waterfront. 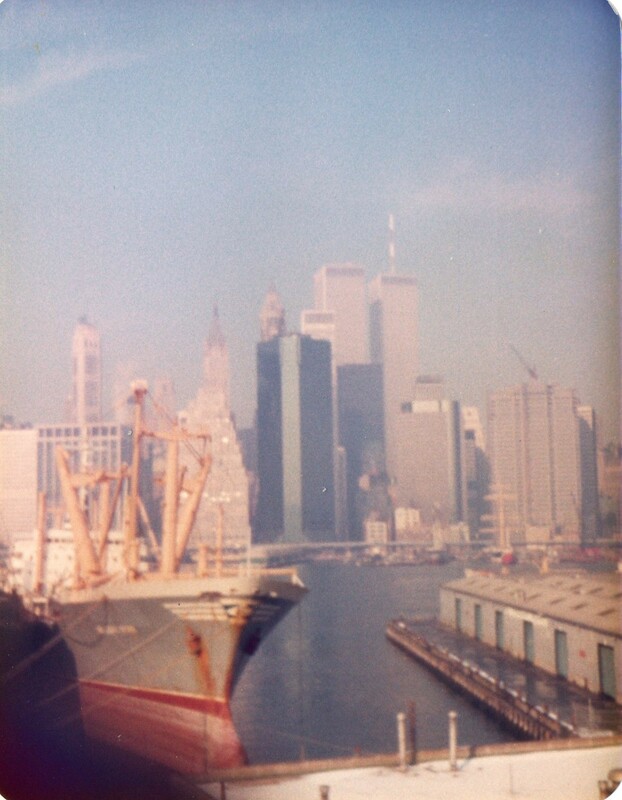 Contrast with the photo below, taken 19 years later from the same promenade.